Total bill amounted to $46+. 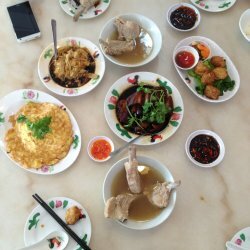 We had fried omelette, tau kee, ngoh hiang, pig trotters and bak kut teh. Their side dishes were not bad. The pig trotters (smallest portion) was quite a big portion for 1 pax and there were lots of meat and collagen in it. The bak kut teh soup was peppery but I prefer Ng Ah Sio. Their bak kut was not very tender and meat did not fall off the bone easily too. Overall, it is worth a try.